Happy New Year! This is the First Mosaic Monday of 2012, and I thought that I would post a mosaic that was a look back at some of my garden photos for the year. The next two images were taken a day apart out my front window. The trees in our neighborhood have been exceptionally late in dropping their leaves. The beginning of last week my Sweet Gum was nearly full of leaves. The next day, after a wind and rain storm, there were far fewer leaves on the Sweet Gum. These two images show a marked difference. In October, one of our neighbors had a whole row of carved pumpkins. We didn’t carve any, ourselves, but did buy as many different colored and shaped pumpkins as we could. Last fall we found a wonderful grass nursery in our town. This pennisetum, called Little Bunny was one of the grasses that we purchased. I am getting really interested in grasses, and would love to have more. 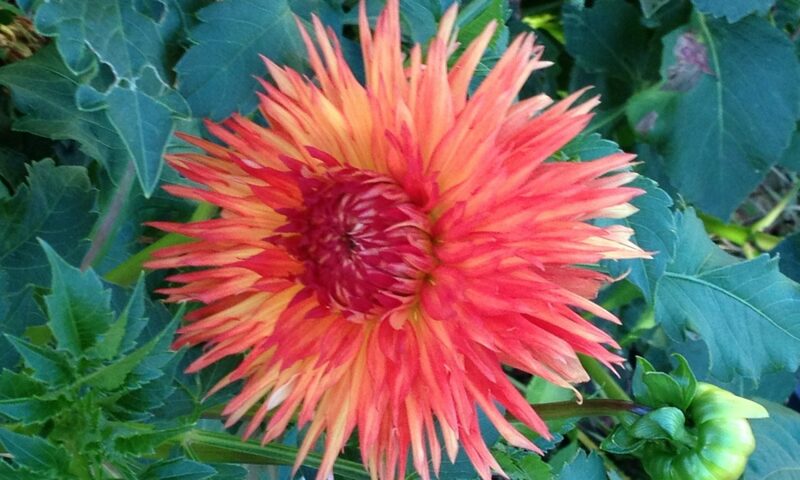 This dahlia, Lorana Dawn, is one of the many dahlias blooming in my garden this last summer. The red clematis was a new acquisition that I got this last summer. It is still in a pot and will stay there for at least a year until it matures a little more. The crocosmia Lucifer is a full and lovely staple in my garden. The hummingbirds go nuts over the flowers and I have had to set up a barrier so the cats don’t get too close to them. The next photo is of a frilly shasta daisy with a yellow center. I love this daisy. The orange daylily is one that was planted in our garden when we moved in. It is double and is very prolific. I have lots of these that I want to plant in more parts of my garden. And finally, is one of our Anna’s Hummingbirds, that is a fixture in our garden. We love to watch the Hummingbird Wars and do our best to keep them in Hummingbird nectar. Well, thats about it for our first Mosaic Monday of the New Year. Thanks to Mary at Dear Little Red House for being the hostess. Don’t forget to Leave a Comment below. or “Like” my Blog on Facebook in the sidebar. Happy New Year! I had to laugh at the Hummingbird Wars…we had a similar situation in our garden this year…they are territorial little things, aren’t they! Love the Pennisetum grass…that’s one I don’t have yet, but it looks super-charming! Happy New Year. Yes, Hummingbirds are indeed territorial and they are endlessly entertaining. It is not without reason the Aztec considered them the Bird of War. Thanks to a post of yours, I found the West Salem grass nursery where I bought that Pennisetum. I visited your blog as well and saw some beautiful pieces of art. What a nice way to look back on the year. Great pictures. Love that you have so many hummingbirds in your garden. I kind of have the opposite situation as you, though I don’t have vegetables or flowers from post to post. This year I want to try to make more room for flowers because all my space is used for container veggies. We’ll try some new things in 2012! Happy New Year! Thanks for coming by. Nice to be looking toward future gardens this year. The deluge of gardening catalogs has begun. I got three today and summer bulbs are ordered since last fall. It is always fun to plan for a new years gardening. Crocosmia lucifer – I’ll have to see if that grows down here. We have lots of Anna’s too – my father puts out lots of nectar and we get hundreds probably a day to his four big feeders. They are great to watch. I’m trying to provide them with plants for nectar also. They love cape honeysuckle, which is very vigorous in our garden.